Fluorite and Crystal Quartz Necklace, 21"
Grade A gorgeous clear Rainbow Fluorite faceted nuggets with sparkly Crystal Quartz chips, accented with Peridot chips, silver beads and a pendant suspended from an intricate Bali Silver bead. 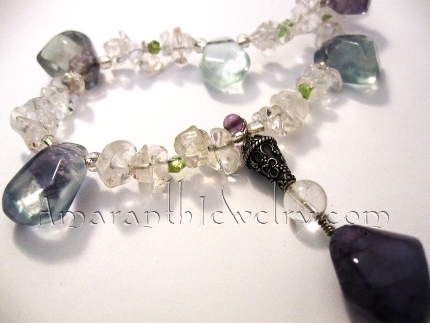 Clasp is hand-wrought Sterling Silver wire with Fancy Jasper rounds. The Fluorite nuggets are about 0.5"x0.5" to 0.5"x0.75" and will display little rainbows in bright light. 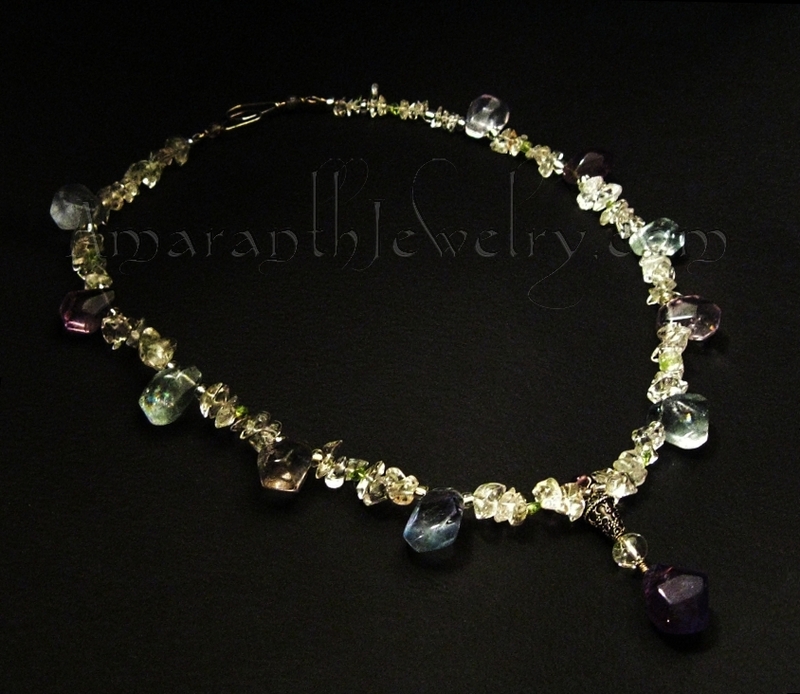 Rainbow Fluorite looks - and is! - rather delicate but it is believed to be a powerhouse, working on three levels - the spiritual, emotional and mental - to promote complete healing. "Rainbow" refers to the different colors the stone may display. Since it is not a very hard mineral, it can chip and/or scratch fairly easily. However, if you take care not to hit it against hard objects while wearing and afterwards store it in its own box, you will get much pleasure out of this beauty.